My friend Angie gave me a bottle of Ume Plum vinegar, asking me to figure out what to do with it. I’ve let this assignment sit on the back burner for a while, not really on purpose, but maybe there was some subconscious procrastination. I tasted the vinegar alone and it’s very salty compared to most vinegars and despite the presence of acid, it’s not really what you expect vinegar to taste like. I had some King Oyster mushrooms and finding new uses for it has been on my imaginary notepad as well so I decided to kill two birds with one stone. I couldn’t believe my luck. This simple recipe, and first try, was perfect. I seriously wouldn’t change a thing about it. 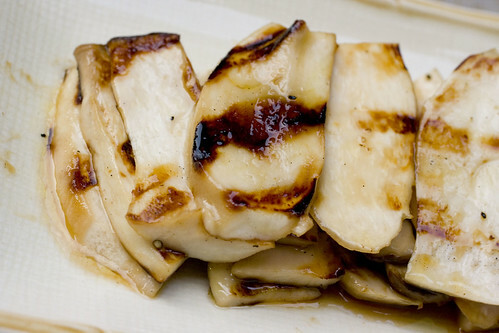 The King Oyster mushrooms have a juiciness that you can’t imagine, even when grilled, and the ume flavor is perfect on mushrooms. 2. In a small bowl, whisk together ume plum vinegar, olive oil, and agave. 3. Cut each mushroom in half width-wise. Then cut into 1/4″ planks. 4. 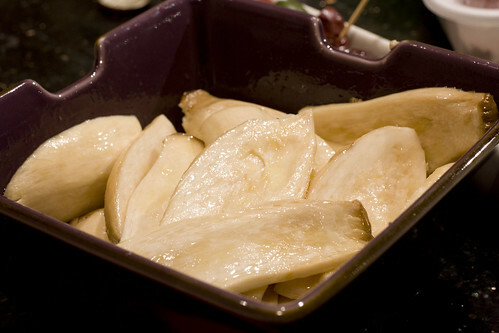 Pour liquid mixture over mushrooms and toss until all the pieces are coated evenly. 5. Grill about 1 minute on each side, depending on distance from heat source. Sprinkle with white pepper to taste. Serve immediately. posted by jessica	at 08:22 AM	Filed under Fusion, Recipes. You can follow any responses to this entry through the RSS 2.0 feed. Both comments and pings are currently closed. I love king oyster mushrooms. I usually saute them, I should definitely try grilling next time, this looks great! 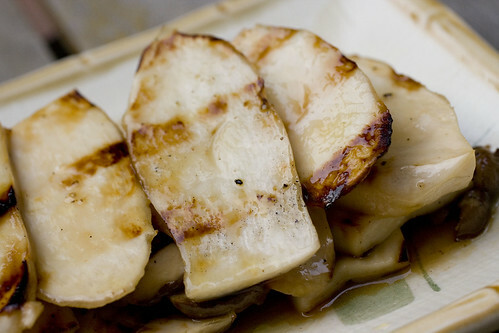 I love the super meaty, toothsome texture of grilled king oyster mushrooms. I will try the use of an acid component and a sweetening agent next time I cook them. Mmm, I love all mushrooms and oyster mushrooms are one of my favs! ume plum vinegar? I haven’t seen it here, is it Japanese? 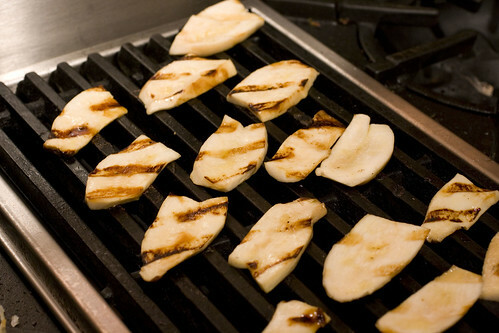 Yum, I love grilled king oyster mushrooms. I often just slather them with BBQ sauce and eat them just like that! Thanks for sharing! Lesley, I’m not sure if it’s Japanese but it seems likely. Mushrooms Canada, I will try BBQ sauce next time. Makes sense, my mom calls the King Oyster Mushrooms, mushroom steak. I’VE BEEN GROWING SHIITAKE MUSHROOMS FOR OVER 20 YEARS AND NEVER SAW OR HEARD OF KING OYSTER MUSHROOMS.